The process of thoroughly blending the dry and wet ingredients in a dough to evenly distribute the fermenting yeast. The proteins in the flour are called gluten. 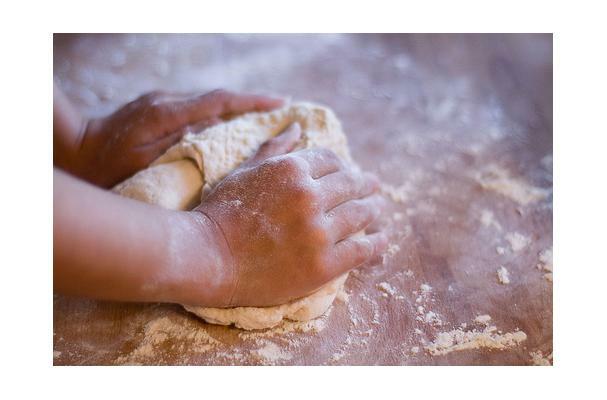 Kneading develops the gluten creating a strong and elastic dough. The elasticity captures the fermenting gas created by the yeast and causes the dough to rise. The time it takes to knead depends on may factors, such as type of flour, quantity of flour (quantity of loaves you are making), temperature and humidity of room. It generally could take from 5 - 10 minutes. Lightly flour your hands and work surface and have additional flour ready as your recipe dictates. Turn the mixed dough out of the mixing bowl onto the floured surface and sprinkle with flour. Push the heel of one hand down into the dough and away from you. Fold the dough over from the top to the bottom and give it a quarter turn and push down and away again. Continue this rhythm of pushing , folding and turning. Add flour as you go. When finished, the dough should not be sticky and should feel satin-like and smooth. There are two types of kneading, Light and Heavy. The above description is for heavy kneading when you are making bread. Light kneading is used for biscuits, scones, etc. when you do not want to develop the gluten as much as you do when making bread.